160 Belgian Paediatricians denounce child euthanasia bill. The media originally reported that 38 Belgian Paediatricians denounced the child euthanasia bill. Later we learned that the actual number was 160 Belgian Paediatricians. The english version of this article was originally published on the HOPE Australia Blog. This article is a Google translation of an article that was published on January 29, 2014 on the Belgian website LaLibre. Is it desirable to extend the law on euthanasia to minors if a large number of experienced caregivers, who, day after day, care for seriously ill children and are able to relieve their pain? This letter is an appeal by paediatricians working in daily practice. It is not an attempt to set in the fridge euthanasia of minors, but a plea for the suspension of a bill that may be passed in haste. Far from being a political or ideological pamphlet, this open letter offers a serene reflection from the caregivers. 1 - This law does not meet any real demand. Most medical teams taking care of terminally ill children at home or in hospital must recognize that they have never faced in their practice a request for spontaneous and voluntary euthanasia expressed by a minor. Even the most complex medical cases can be solved in the current legal framework, with the means and expertise at our disposal. For whom is this legislation therefore designed? Abroad, there are no other claims for a similar legal framework. A recent survey of paediatricians from 19 countries showed that neither their citizens nor their paediatricians perceive the need for a legal framework in Austria, Czech Republic, Denmark, Hungary, Ireland, Israel, Italy, Norway, Portugal, Slovenia and Sweden. Palliative care in respect of the sick child removes any demand for deliberate death. Only a very small number of paediatricians in Australia, France, Germany, Spain, United Kingdom and some states of the United States demand, today the creation of a legal framework on the grounds that palliative care would be inadequate in exceptional cases. 2 - In the present state of medicine, means to alleviate the suffering are widely available in our country, more than in most other countries. It is clear today that no patient and therefore no child should suffer. It must also be given to any form of medical determination, through a timely and progressive therapeutic escalation, so not to prolong life in difficult circumstances. In addition, we are now able to fully control the physical pain, choking, or anxiety as they approach death. The palliative care teams for children are perfectly capable of achieving pain relief, both in hospital and at home. The draft law on the extension of euthanasia was discussed too quickly in the Senate and in the House recently all requests in the House to conduct new hearings of experts in paediatrics were rejected. We can hardly speak of a peaceful and duly informed debate. This policy precipitation creates the impression that the situation is dramatic in our country and that we must act urgently. We categorically deny this false impression and say that the situation in our country is far from dramatic. Insufficient attention is paid to the efficient and commendable initiatives of many caregivers. Their work can never be appreciated at its true value! 3 - The management of critically ill children is already complex enough. In such circumstances, it is even more difficult for the medical staff and the family to be further faced with a particularly difficult ethical choice: are we going or not, use active euthanasia? Paediatric caregivers are witnessing the indescribable pain of the parents of a sick child terminally ill. The extension of the law to children will only increase their distress and stress. In the proposed law, parental consent appears as a safety lock, which occurs after the request for euthanasia is expressed by the child. In practice, things can appear very differently: the request of the child may be suggested by parents who are beginning to hope that the pain will not persist too long and, consciously or unconsciously, encourage the child to ask for 'an end’. It is not incongruous that a child endowed with a particular sensitivity to perceive the option of euthanasia as a solution or a duty, especially if he feels that his parents can no longer bear to see him suffer. 4 - According to the current draft law, the ability of the minor to discern is a condition of admissibility of the request for euthanasia. However, in practice, there is no objective method for determining whether a child is gifted with the ability of discernment and judgment. So this is actually largely subjective and subject to other influences. Because, today, thanks to the development of effective palliative care for children, it does not appear objectively necessary to adapt the legislation, because it is contradictory to assert the autonomy of the minor child, found fit to make a request for euthanasia, while requiring parental consent, finally, because there is no objective measure of the ability of a child to discern, we believe that the issue deserves further consideration. For the list of signatories, go to the original text. 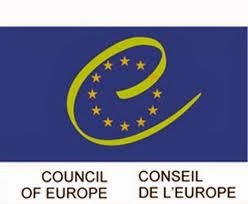 ─ Council of Europe: Declaration condemning euthanasia for children in Belgium. ─ Belgian Protest: Stop the extension of euthanasia to children. ─ Petition to the Belgium government: Stop euthanasia of minors. Link to the Council of Europe Declaration. ─ promotes the unacceptable belief that a life can be unworthy of life which challenges the very basis of civilised society. Anyone who thinks that the so called ‘right-to-die’ isn’t a loaded gun aimed right at the heads of disabled people simply isn’t paying attention. A cursory perusal on-line of such organizations as Compassion & Choices, Ergo and Final Exit Network yield a plethora of examples. Compassion & Choices has a long-term disabled man demanding the ‘right to die’ on their home page. His essay states that he is ”a 38-year-old disabled man with a terminal diagnosis of Duchenne Muscular Dystrophy.” From the photograph accompanying the story, he seems to have a power wheelchair and a ventilator. I find it interesting that he calls MD “a terminal diagnosis,” as I have several friends with MD, none of whom consider it terminal. It is, in fact, a long-term disabling condition caused by a genetic anomaly. In his article “Farewell to Hemlock: Killed by its name,” on the Ergo site, Derek Humphry says that Hemlock was, “fighting for voluntary euthanasia and physician-assisted suicide to be made legal for terminally and hopelessly ill adults.” Disability activists know that ‘hopelessly ill’ means us. To work toward obtaining the basic human right of competent adults to choose to end their lives on their own terms when they suffer from irreversible physical illness, intractable pain, or a constellation of chronic, progressive physical disabilities. Which makes it abundantly clear that they mean us. 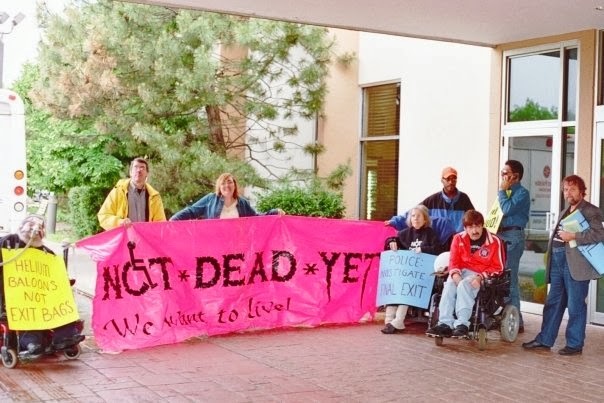 Thus it is apparent that these major ‘right-to-die’ organizations are really ‘better-dead-than-disabled’ organizations and that the people that they want the right to get rid of certainly include people with long-term physical disabilities – us. I have to confess at this point that I, too, had not been paying attention to this for some time. I’ve been living in my rural paradise and ignoring, to some extent at least, the fact that these organizations have all come out to blatantly target disabled people. When I was more directly involved in the Jail Jack campaign and other Not Dead Yet activities, the ‘better dead than disabled’ crowd were screening this agenda from the public. Back then they wanted everyone to believe that it was only for those that were imminently dying and we were a lunatic fringe to feel threatened. I remember the furor when Faye Girsh, then President of Hemlock Society, came out with a press release stating that nonvoluntary euthanasia for the mentally incompetent and elderly was part of their agenda. Rather than officially retract the statement, she passed it off (and the national press let her) as ‘unofficial.’ I’m still scratching my head, trying to figure out how a press release on the organization’s letterhead can be ‘unofficial.’ Including non-terminal people with disabilities was controversial then, but my research shows that including us is now accepted within the ‘right-to-die’ lobby. This makes it all the more sinister that they have been changing the law in states like Washington, Vermont and New Mexico and it makes me even more thankful to the dedicated activists from Not Dead Yet and sister organizations that prevented legalization in Massachusetts, Québec and California. 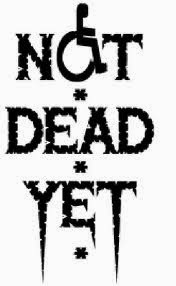 I’ve come back to active status in Not Dead Yet through the issue intruding on my otherwise quiet life. First early last year, a friend told me about another friend of hers who was being systematically starved to death in a nursing home despite being willing and able to feed herself. Apparently a relative that lives far from here had her put in the nursing home following a heart attack to ‘recover,’ then ordered them not to feed her. Despite the fact that she’d never been declared incompetent and made her wishes known loudly and often, the nursing home was following the relative’s instructions. I started preparing for a direct action protest, but also advised my friend that she could and should just get her friend out of there. “Just take her home,” I advised and if the relative or anyone else showed up, let me know and I’d be there with media. Her friend lived at home for several more months and eventually died quietly in her own bed. A second wake-up call occurred when my husband (who is also a wheelchair user) was in a local hospital for a GI issue and the doctor put a DNR (do not resuscitate) order on him without our knowledge or consent! We found out about it when the anesthesiologist for a procedure told us they would be suspending it for the duration of the procedure. What? I was livid! By the time we got back up to the floor following the procedure, the hospital ombudsman had found the doctor and she and I talked. She claimed that it was a clerical error and that they would not have followed it had he been in crisis because an armband is supposed to accompany the order and he did not have one. I informed the hospital that I would forgo suing them (for now) only if they reviewed the systems that allowed such a ‘clerical’ error to occur and put in safeguards against it happening again. I’m still not sure I believe the ‘clerical error’ story, but medical facilities are limited and I’d not like for my sweetheart to be denied services so I’m letting it pass. The final straw was a Facebook conversation that I had yesterday with an apparently otherwise savvy disabled woman. She didn’t know what NDY is when I mentioned it, and demanded that I defend the ‘better dead than disabled’ characterization of the ‘right to die’ movement and accused me of ‘beating a drum’ and using her post to do so. However, my research on the ‘better dead than disabled’ movement today has more than justified my statements in that conversation and I definitely stand by them. I, for one, intend to pay attention, starting now. I invite all of my sisters and brothers in the disability rights movement to join me. It’s no exaggeration to say we’re in the fight of our lives. Suicide Prevention? Yes. and Euthanasia Prevention! The Living With Dignity network salutes this important initiative. At the same time, members of the National Assembly are about to vote on Bill 52, An Act respecting end-of-life care. 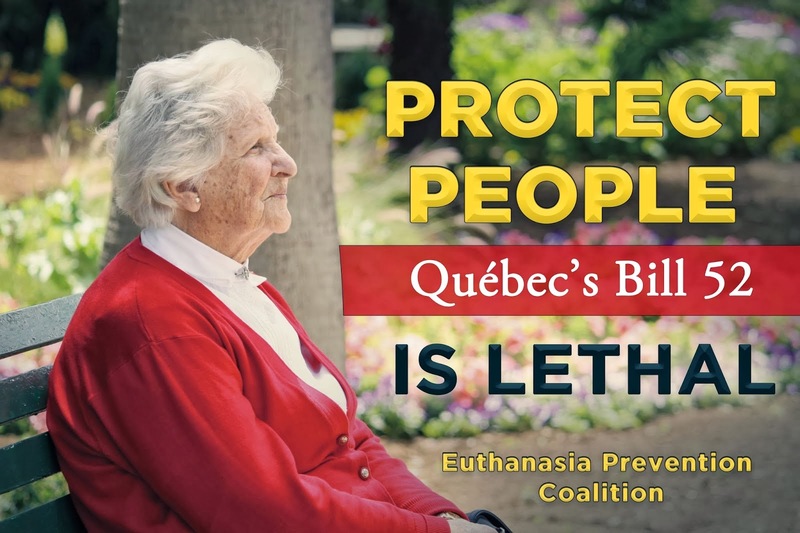 If passed, this bill will legalise euthanasia in Quebec. How ironic! On one hand desperate people will be told “Don’t kill yourself, seek help”. On the other hand, they will hear “We’ll help you die”. 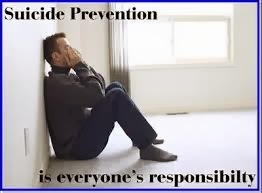 One of the objectives of the Prevention week is to provoke a “culture change towards the suicide problem in Quebec.” This is an excellent idea, since the current culture forgets that euthanasia is also a dangerous idea – a practice that goes hand in hand with suicide. The causes of suicide are complex, but the people who take this fatal act usually do so to put an end to their emotional or physical pain. However, one of the eligibility criteria to “medical aid in dying” (the euphemism used by Bill 52 to disguise euthanasia) is that the person must be experiencing physical or psychological pain that they judge intolerable (even if they are refusing treatment, including for depression). Yet, doctors specialising in palliative care keep repeating that modern medicine can relieve physical pain. Bill 52 is not necessary. It is dangerous and threatens the security of the most vulnerable. Do not forget that one day we will all become vulnerable. Prevent suicide. And block any project allowing euthanasia, regardless of its disguise. Urge your MNA to vote against Bill 52. Oregon's 2013 assisted suicide statistics have been released. Link to the report. This 2013 annual report is similar to prior years. The preamble implies that the deaths were voluntary (self-administered), but the information reported does not address that subject. Oregon's assisted suicide law, itself, allows the lethal dose to be administered without oversight. This creates the opportunity for an heir, or someone else who will benefit from the patient's death, to administer the lethal dose to the patient without the patient's consent. "Even if he struggled, who would know?" The 122 prescriptions for suicide resulted in (63) people dying by assisted suicide [8 people who died by assisted suicide obtained a lethal prescription in a previous year], (28) deaths from other causes, (31) people - the status is unknown, (7) people died but no information is known, and the status is pending for (24) deaths. 69% were aged 65 years or older; the median age was 71 years. As in previous years, most were white (94.4%), well-educated (53.3% had at least a baccalaureate degree). Only 2 of the 71 people who died by assisted suicide received a psychiatric evaluation. The prescribing physician was present at the death in 8 of the 71 deaths. In 2013 there was a significant increase (12) in assisted suicide deaths related to "other illnesses." 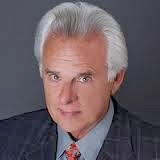 The list of other illnesses includes chronic conditions, such as diabetes. Depressed patient died by assisted suicide in Oregon. Assisted suicide prompts some terminally ill patients to give up on life prematurely. Oregon 2012 assisted suicide report, A complete analysis. Quick facts about assisted suicide. Assisted suicide: Full of dangers. Margaret Dore: Oregon's new dwd report. Oregon's new dwd report: "We should be taking out young girls as soon as they hit a certain milestone?" Per the report, most of the people who died from a lethal dose were white, aged 65 or older, and well-educated. People with these attributes are typically well off, i.e., the middle class and above. Moreover, their ingestion of the lethal dose can be explained by a desire to pass on funds to their heirs. The Oregon report is also consistent with elder abuse in which ingestion of the lethal dose is less than voluntary. The report gives no information regarding whether the people who ingested the lethal dose did so on a voluntary basis. In the United States, elder abuse is a huge problem. Oregon's report also lists "concerns" as to why the people who ingested the lethal dose did so. These concerns are reported by the prescribing doctor using a check-the-box form developed by suicide proponents. The form is designed to promote the listed concerns as acceptable reasons to kill yourself. For example, one listed concern is "inadequate pain control or concern about it." There is, however, no report of anyone who ingested the lethal dose who was actually in pain. Another listed concern is "losing control of bodily functions." With this kind of reasoning, we should be taking out young girls as soon as they hit a certain milestone? A copy of Oregon's new report can be viewed at this link: For more information, please see the footnotes below. 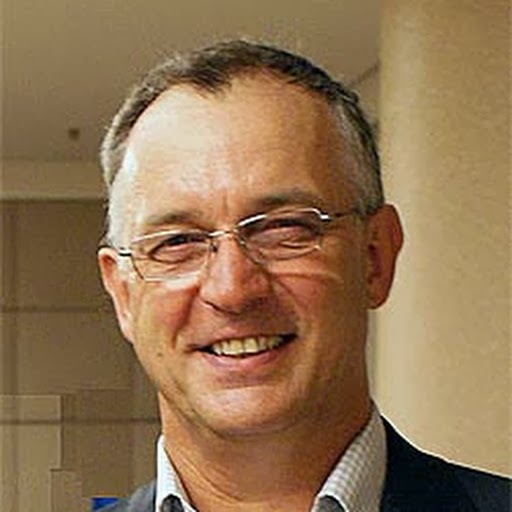 The following blog was published by Paul Russell on the HOPE Australia blog. Palliative Care Australia recently sponsored a motion at the World Health Assembly earlier this month that was passed by the Executive and will now be recommended for adoption by the entire World Health Assembly when it meeting in May this year. The resolution, co-sponsored by the Australian Government, calls for countries to ensure that palliative care is a core part of health systems, that palliative care is embedded in the basic and continuing education and training for all health workers, and to ensure adequate access to pain medications. The PCA press statement goes on to discuss the shortfall in availability of services, even in countries like Australia and confirms that quality palliative care services are cost effective and may even save money for health service providers. You can read the full PCA Press Statement HERE. 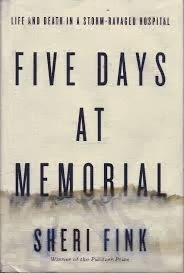 Book Review: Five Days at Memorial. The following book review was written for and published by a national publication. Euthanasia did not occur out of desperation, but rather out of errors and a false sense of compassion. The 558 page book, Five Days at Memorial, tells the complete story of what happened at Memorial Medical Centre in New Orleans during the Hurricane Katrina disaster that began on August 28, 2005. Pulitzer Prize winning author, Sheri Fink, through interviews, articles and evidence from attempted prosecutions, uncovers the decisions, the attitudes and the actions that led to at least 20 homicides at Memorial Medical Centre following the Katrina disaster of 2005. Fink identifies how the decisions were made, those who allegedly gave intentional lethal doses of morphine, the hero’s of the story and the legal proceedings that followed. Fink presents the evidence in a chronological fashion. Many people have argued that the Katrina deaths were the result of decisions that were made in extreme conditions. After reading this book it becomes clear that decisions that were made to leave the hardest patients to move last, created a situation where certain physicians made lethal decisions. 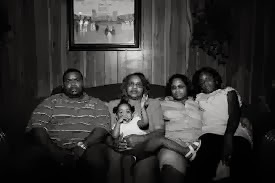 Emmett Everett with his family. The story of Emmett Everett brings home how the euthanasia mentality leads to the deaths of people with disabilities. Everett was not sick and dying, but rather he was 380 pounds and paralyzed below his waist. Everett, who at one point was taken for dead when he was resting, had effectively survived through the ordeal. The morning before he died he was upbeat and getting ready to roll out of the hospital. Everett was injected, not because he was in pain, or because he was so near to death that nothing could be done for him, but because he was partially paralyzed and weighed 380 pounds. It is important to note that Memorial was not the only hospital that was stranded by flood water and without electricity, but Memorial was the only hospital where a few doctors decided to respond to this horrific circumstance by injecting patients with massive doses of morphine and sedatives with the alleged intention of causing death. It is also interesting to note that in the chaos, the doctors never noticed and the hospital administrators never bothered to inform the medical practitioners that the cancer wing of the hospital continued to have electricity. Five Days at Memorial is an important book for people who want to understand how otherwise caring medical practitioners can become killers. Poor decisions, stressful conditions and negative attitudes towards people with disabilities and people with terminal and chronic conditions led to decisions to kill. Considering the significant abuse of euthanasia in Belgium and the Netherlands, we must be vigilant and oppose the legalization of euthanasia in Canada. Five Days at Memorial makes it clear, that the power to kill must not be granted to others. This article was written by Wesley Smith and published on January 26, 2014 on his blog. Cleaver or no, the assisted suicide advocacy group Hemlock Society Compassion and Choices has spent years blurring definitions and redefining terms–with the active compliance of the media. • “Medical aid in dying” is the injection of a poison that kills immediately. • “Medical aid in dying” is euthanasia, forbidden by the Criminal Code. • Bill 52 won’t solve the lack of access to palliative care. • Modern medicine is able to relieve all physical pain. • The provisions of Bill 52 which are aimed at legalizing euthanasia are unconstitutional. • Bill 52 will irreparably damage the health care system. • Legalizing “medical aid in dying” is against the law. • Only the federal parliament can legalize euthanasia. • The oversight of the Commission’s processes don’t provide sufficient guarantees for the safety of patients. • To claim to the contrary is to deceive the public and our legislators. • 88% of palliative care physicians oppose Bill 52. • 67% of Quebecers don’t understand what “medical aid in dying” is. • 69% of Quebecers don’t have access to palliative care. • 25% of Quebecers don’t have a family doctor. • 34% of Montrealers don’t have a family doctor. • Bill 52 is modelled closely on the Belgian euthanasia law. 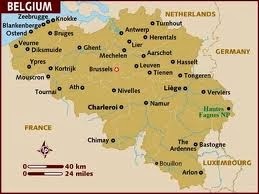 • Belgium: 1.4% (1,432) reported deaths by euthanasia. • Netherlands: 3% (4,188) reported deaths by euthanasia. • Quebec: of 60,800 deaths, there would be between 850 and 1,824 deaths caused by euthanasia, based on the Belgian or Dutch percentages. • 47% of euthanasia cases in Flanders (Belgium) are not reported. • 32% of euthanasia cases in Flanders (Belgium) are carried out without the patient’s explicit agreement. • 78% of euthanasia cases in Belgium are carried out without agreement and without discussion with the patient. • 6% of euthanasia cases in Belgium are carried out by nurses (which is illegal). • 23% of lung transplants in Belgium come from donors killed by euthanasia. • Deaf twins were euthanized because they were going blind (Belgium). • Woman was euthanized because she was depressed, her family not notified (Belgium). • Woman was euthanized because she was anorexic (Belgium). 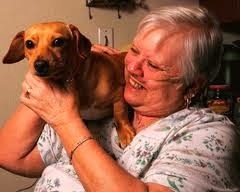 • Woman was euthanized because she was going blind and couldn’t handle not seeing dirt (Netherlands). • In 2013, the World Medical Association (WMA) publicly stated its position against euthanasia. WMA is composed of 106 member states, representing over 9 million physicians. 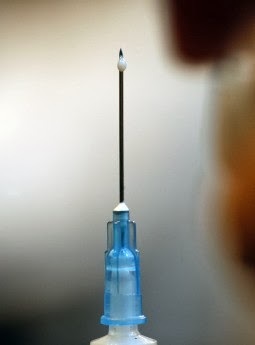 Of 196 countries in the world, there are only 3 countries where euthanasia is legal. • 99.6% of the world population is protected by laws against euthanasia. 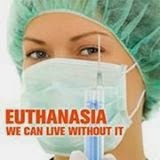 Only 0.4 % of the world population is not protected against euthanasia. 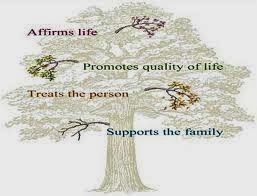 • According to the World Health Organisation, palliative care intends neither to hasten nor postpone death. 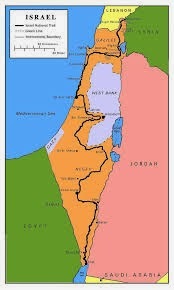 Israel assisted suicide bill will be defeated. News reports in Israel are stating that an assisted suicide bill will not pass. Minister Uri Orbach says he will oppose the legislation of the MK Ofer Shelach (Yesh Atid) proposal to allow doctors to prescribe suicide medication for self-administration in case of terminal illness, "The health system cannot take responsibility for the euthanasia of terminal patients. Anyone who wants to take their own lives is not under the care of the state," said Orbach. The Ministerial Committee on Legislation plans to debate a new bill that seeks to legalize doctor-assisted suicide for terminally ill patients. The bill has sparked controversy in the medical community in Israel, and many doctors have urged Shelah's fellow Yesh Atid member Health Minister Yael German to oppose the bill. "Doctors in Israel have earned the public's trust because of our outstanding dedication to saving lives," Israel Medical Association Chairman Dr. Leonid Idelman said. "This trust will be detrimentally harmed if, heaven forbid, any doctor pursues euthanasia." 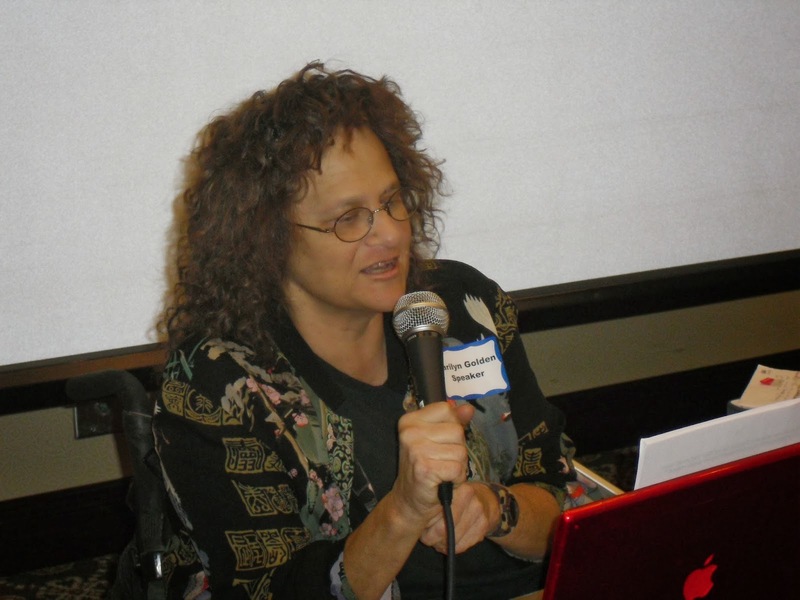 In a letter to German, Idelman noted that the World Medical Association's official position on the matter states that euthanasia is unethical. 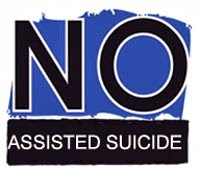 Assisted suicide must be prohibited. Assisted suicide allows one person to be involved with causing the death of another person. All jurisdictions have experienced some abuse of assisted suicide laws. Yes to palliative care available to all, but no to euthanasia under the name "medical aid in dying"
The Members of our National Assembly will soon be called upon to vote on Bill 52. This proposed law, were it to be adopted, would legalize euthanasia under the name"medical aid in dying." In Québec, the act of causing death would be considered a form of "care" that could be offered and "administered" to the terminally ill. This bill must not pass. To cause death to a sick person is not to care for him. A lethal injection is not a treatment. Euthanasia is not a form of care. On January 13, 2014; Judge Nan Nash, of the Second Judicial District in New Mexico made the wrong decision in the case Morris v New Mexico. Nash decided to legislate from the bench by allowing New Mexico doctors to prescribe lethal drugs to assist the suicide deaths of their patients. Urge Attorney General Gary King to appeal the assisted suicide court decision. 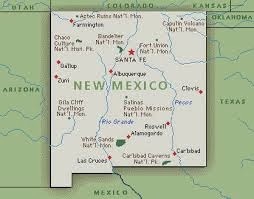 Protect New Mexico Citizens from Assisted Suicide. King said discussions with 2nd District Attorney Kari Brandenburg are ongoing about possible grounds for an appeal. The most likely point of legal attack is which arm of government has appropriate jurisdiction to establish physician-assisted suicide policy. “This is a decision that’s sort of in the realm of the state Legislature,” King said. This is the radical step: some people, usually non-disabled people (but not exclusively so), judge other people (disabled people) as appropriate candidates for elimination, as having lives not worth living. The next steps are: ‘it would be a mercy to allow this no-longer-fully-paid-up person to die’; ‘it is the only compassionate thing to do’; ‘suicide or euthanasia is the morally right choice’. Almost universally, those who die by euthanasia are disabled in some way. It is just false to say that ‘everyone who is like this’ will want to die. Those who despair especially at the time of their injury, most often adapt given sufficient time, and the right support. Only 1 out of every 4 or 5 doctors in A&E (emergency room) say they can imagine life as a quadriplegic, but 90% of quadriplegics say they are happy to be alive. The vast majority of disabled people want to live. Laws, by their nature, must be general. This generality ‘this disabled person and all people like them want to die’ – this is the false move in legalising euthanasia, and the consequences are dire. If you don't think euthanasia is dangerous? Maybe this might change your mind. This article was originally published by Paul Russell on the Hope Australia blog. I don't feel at all qualified to speak on behalf of people living with disabilities even though I have shared in the lives of many people over the years and I have a son with Down Syndrome. Certainly, my association with other families who have children with Downs and spending time with dear friends with disabilities has enriched my perspective, but I don't want to stand in a public space on this issue principally because people living with disabilities can and do speak well for themselves. It is they who we should be listening to. Certainly, Anne and I have experienced some discrimination in our time, but really only in a small way. Enough, however, to know that just below the surface of even cordial exchanges can lie poor attitudes and even bad intentions. The testimony of many friends bear this out in some disturbing ways. So, when people living with disabilities speak out and say that they fear euthanasia and assisted suicide we ought, at the very least, to accept that they have a unique perspective that should be heard. And when speaking out is in response to offensive behaviours, personal and even corporate, against people with disabilities as individuals or as a community we should remind ourselves that not everyone is as inclusive and egalitarian as we would hope that we are ourselves. Note also that the writer attempts to sanitize the deliberate killing of people with disabilities by adding the adverb 'ethically'. We've seen this all before. The eugenics movement circa the early 20th century made its sinister case based almost entirely on this kind of soft-sell. German woman, 93, tells how her siblings defied Hitler and were put to death for treason for organizing the White Rose Campaign in 1943. By Allan Hall, Daily Mail - January 18,, 2014. Link to the original article. It was a cold winter's day in 1943 when three students threw a pamphlet into the stairwell at Munich's Ludwig Maximillian university, the last of six they had distributed decrying Nazism. And their writings recounted the heavily suppressed story of how the Wehrmacht had been stunningly defeated at Stalingrad a month earlier - a battle which proved the turning point of the war. But, unbeknownst to them, a janitor at the university spotted their surreptitious leaflet drop and reported them to the Gestapo, the Hitler regime's feared secret police. Twenty-four hours later, they were under arrest and, within days Sophie Scholl, her brother Hans, 24, and their friend Christoph Probst, also 24, were all beheaded for treason. Now, 71 years later, the guillotine used to carry out the gruesome sentence has been found gathering dust in the basement of a Munich museum, triggering a debate in Germany about whether it should go on show, or remain locked out of sight forever. For one elderly woman in particular it has pulled into sharp focus all the pain, anguish and terror she experienced over seven decades ago when her younger sister and elder brother went bravely to their deaths. Elisabeth Hartnagel-Scholl is the last surviving sibling of Hans and Sophie Scholl, two of the young martyrs who dared to challenge the world's most sinister tyranny and paid the ultimate price in doing so. 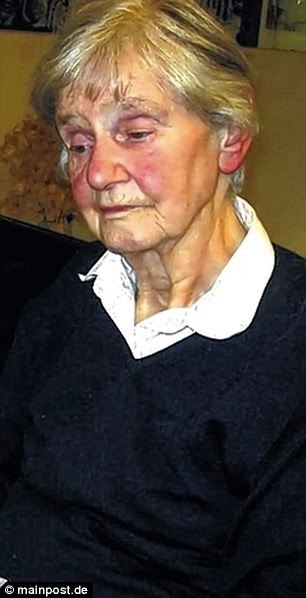 Now a 93-year-old widow, she lives alone in Stuttgart, but she clearly remembers the day that she discovered her brother and sister had died beneath the flashing blade of the guillotine. Assisted suicide full of dangers. The following article was written by Marilyn Golden and published in the Albuquerque Journal on January 18, 2014. With the stroke of a pen, a New Mexico judge unraveled some of the most basic protections people in our state have when facing serious illness or disability. This week, Judge Nan G. Nash of the Second District Court in Albuquerque ruled that the health care system and those entrusted to deliver medical care cannot be prosecuted for prescribing a lethal prescription overdose for the purposes of assisting in the suicide of someone with serious disease or disability. This ruling tears away at the fabric of what those of us in the disability rights movement have been working to improve: a health care system free to deal with each individual uniquely rather than as a line-item on an accounting ledger, the elimination of abuse and coercion by those seeking to profit or take advantage of someone during a difficult time, and the illusion that individuals with a severe illness or disability should be measured by a flawed societal definition of quality of life. Nash’s ruling codifies the idea that some lives are not worth living and they should have the option, if not the duty, to “choose” a premature death via a doctor’s prescription pad. This turn of events in states like New Mexico and Oregon is a frightening prospect for persons living with a disability. If the practice of assisted suicide becomes normalized, what real choice is there for those of us who can cost the most to care for, and need assistance by equipment, specialized vehicles and personal aides to perform daily tasks? Such was the choice given in the now infamous case of Barbara Wagner in Oregon. 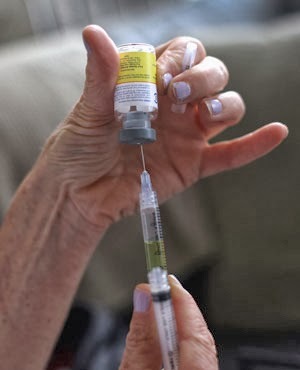 Oregon’s assisted suicide law passed in 1998 and has been widely scrutinized by those in the medical community, disability rights advocates and ethicists who have noted many examples of unreported problems and complications with the law, generally only brought to light through investigative reporting or personal testimonies. Wagner was an Oregon retiree diagnosed with lung cancer. During the course of her treatment, her physician recommended particular chemotherapy, but within weeks, she received a notice from her insurer that they would not cover the life-saving treatment. However, they would pay for assisted suicide. Some may believe that an aging grandmother who contracted lung cancer and is in an advanced stage has the obligation, for the good of the herd, to request a lethal prescription and go quietly into the night. We foresee very dangerous social ramifications, as disability and disease are further quantified. As we work towards world-class health care and access for all, the legalization of assisted suicide is a move toward health care quality and access for only the select. Further, legalization of assisted suicide does not account for the pressures or coercion from family members or others. While we may think coercion or pressure to die would never happen in our family or acquaintance circle, that cannot be said of every family, and unfortunately, statistics on elder abuse show that ulterior motives can often arise. In fact, the laws that apply in Oregon and now New Mexico only say that a person must be of a sound mental state when the lethal dose is prescribed. There is no safeguard for an individual’s mental state when the prescription is administered or ingested. 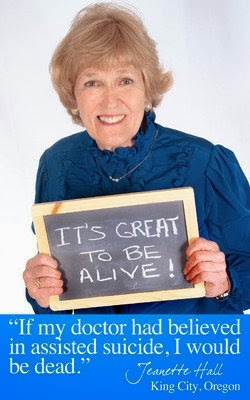 The fact is, even those individuals facing the very end of life have multiple options offered by palliative and hospice care that make assisted suicide unnecessary, such as palliative sedation, where sufficient medication can be provided to render the patient unconscious, if necessary, until he or she passes peacefully. Assisted suicide is a dangerous across-the-board health care policy, particularly for those of us that live with disability and serious disease on a daily basis. Nash seems to have ignored all the dangers posed to the disability community and seriously ill when the ruling was issued. We hope New Mexico Attorney General Gary King will stand with the disability rights community and appeal this decision. The Disability Rights Education and Defense Fund is a leading national civil rights law and policy center whose mission is to advance the civil and human rights of people with disabilities. Five dangerous myths about death and dying. Suicide prevention at odds with assisted suicide.